Packed with interactive features in a sleek folding design, nintendo DSi enhances your gaming experience like never before. A world of downloadable fun awaits with DSiWare, exclusive to the nintendo DSi system. Discover unique gaming experiences from adventurous developers, and a range of fun & useful applications-all downloadable wirelessly using Nintendo DSi Points. Nintendo DSi Camera - The Nintendo DSi system has two cameras ? one camera is on the external body, and the second one points at the user when the device is flipped open. As the first truly interactive digital camera in a video game system with 10 different interactive "lenses" that can manipulate your photos, the Nintendo DSi Camera offers an easy way to take and share your photos with family and friends. Nintendo DSi Sound - DSi Sound application acts as both an interactive voice recorder and music player that allows users to play with their music while they listen to it. Users can access different audio filters or control the pitch and speed of recorded voice or music files to alter voices or change the tempo of a song. Download DSiWare games and applications from the shop to enjoy a range of unique interactive experiences. 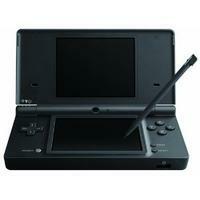 Find out more about all the benefits of going wireless with Nintendo DSi. Nintendo DSiWare- This application will populate Nintendo DSi with software that can be downloaded using Nintendo DSi Points directly to the portable system, just as WiiWare has with Nintendo's Wii console. Developers big and small are invited to create software that makes use of the properties and functions of the hardware. Nintendo DSi Points - Purchase a Nintendo Points Card at your local retailer, and then enter the unique number on the back of the card in the Nintendo DSi Shop application to redeem for Nintendo DSi Points. Use your points to download the DSiWare games and applications of your choice.